Find out how the Tavanero virus affects Mac desktop computers and learn how to prevent Safari, Chrome and Firefox from being redirected to the rogue site. Browser hijackers are classified as low-profile threats that cause little damage. Nonetheless, these offending applets tend to call forth a great deal of frustration for anyone infected. 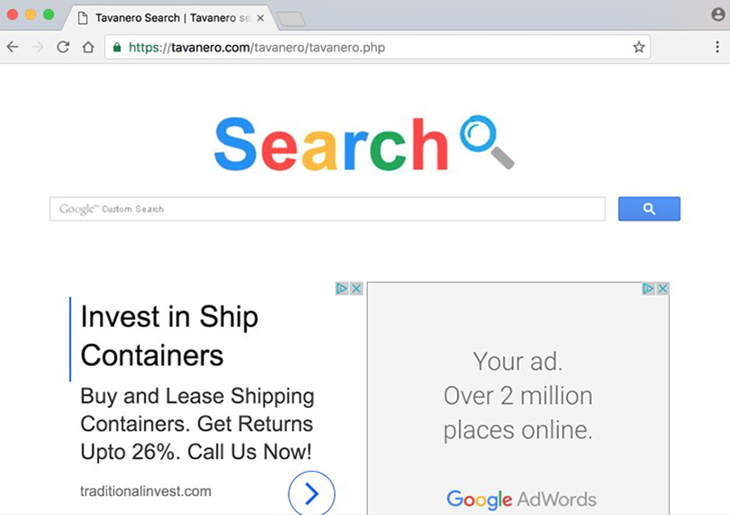 Mac users who fall victim to a widespread strain called Tavanero are unable to set their regular Internet surfing preferences and get stuck with a rogue search provider that keeps popping up in Safari, Chrome and Firefox alike. The actual URL of the landing page is http://tavanero.info/tavanero/tavanero.php . It appears to be a service powered by Google Custom Search and stuffed up with large ad sections. Obviously, its purpose has little to do with enhancing one’s web search experience. Instead, the adware campaign operators pursue the goal of making money off of the display of sponsored information below the fold. The modus operandi of the Tavanero Search virus is based on a series of unauthorized steps, starting from installation on a Mac, all the way to making changes to the custom setup of web browsers. To make its way into a system, the adware in question glues up to various freeware and shareware products available on dubious application repositories online. This isn’t an illegal practice – in fact, bundling of this sort is a popular way of distributing regular apps. The pitfall of such software packages, though, is that additional “featured” offers aren’t necessarily listed on the installation wizards in a clear way. Ultimately, a user may install a Torrents client or an open-source media player without realizing that a potentially unwanted piece of code is sneaking inside along the way. The Tavanero virus primarily interferes with web browsers it detects on the infected Mac. By adding a new aggressive plugin without producing any prior authorization requests, it gets a set of privileges that are sufficient to modify a number of preferences. These include the homepage, as well as new tab page and default search engine. They all get automatically substituted by Tavanero.info. The domain name proper is followed by a repetitive argument string mentioned above. These configuration level alterations have absolutely tangible consequences. The victim’s browsers will be redirected to a website that they never chose to use. Again, the landing page isn’t dangerous to visit, but it blatantly takes over Internet navigation clients running on the machine. To get rid of Tavanero, it’s recommended to follow a specially crafted adware termination procedure. When confronted with malicious code like the Tavanero on Mac, you can neutralize its toxic impact by leveraging a specially crafted system utility. The Freshmac application (read review) is a perfect match for this purpose as it delivers essential security features along with must-have modules for Mac optimization. This tool cleans unneeded applications and persistent malware in one click. It also protects your privacy by eliminating tracking cookies, frees up disk space, and manages startup apps to decrease boot time. On top of that, it boasts 24/7 tech support. The following steps will walk you through automatic removal of the Tavanero infection. 4. Check whether the Tavanero redirect virus has been fixed. If the lock screen is still there, go to the Uninstaller option on Freshmac GUI. Locate an entry that appears suspicious, select it and click Fix Safely button to force-uninstall the unwanted application. 5. Go to Temp and Startup Apps panes on the interface and have all redundant or suspicious items eliminated as well. The Tavanero adware fraud shouldn’t be causing any further trouble.